AMHERST, Mass. – Declining populations of pollinators is a major concern to ecologists because bees, butterflies and other insects play a critical role in supporting healthy ecosystems. Now a new study from urban ecologists at the University of Massachusetts Amherst suggests that when urban and suburban lawns are left untreated with herbicides, they provide a diversity of "spontaneous" flowers such as dandelions and clover that offer nectar and pollen to bees and other pollinators. Private lawns make up a significant part of urban lands in the United States, an estimated 50 percent of city and suburbs, say Susannah Lerman and co-author Joan Milam, an adjunct research fellow in environmental conservation. They write, "Practices that support nesting and foraging opportunities for bees could have important implications for bee conservation in suburban areas." Lerman, an adjunct UMass Amherst faculty member who is also with the U.S. Forest Service, says, "We are still surprised at how many bees we found on these untreated lawns." 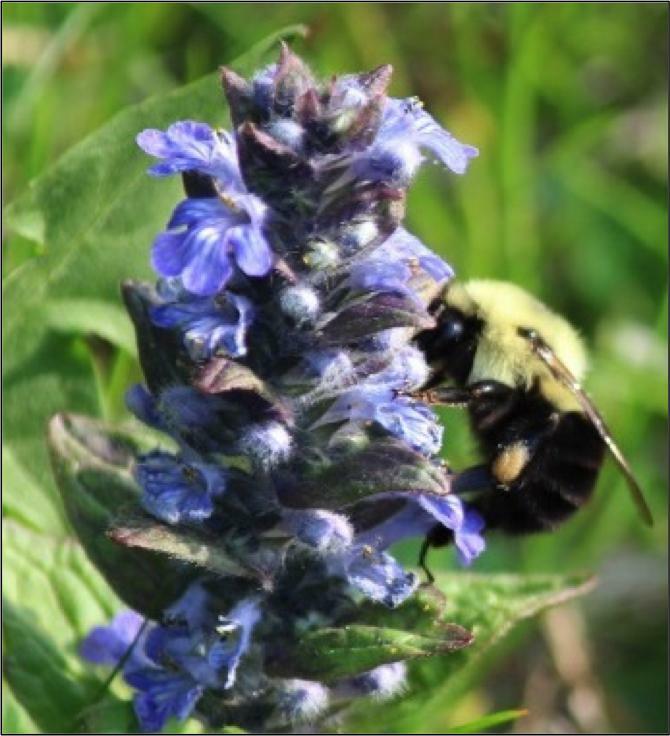 In this study of lawns in suburban Springfield, Mass., she and Milam found that "spontaneous lawn flowers could be viewed as supplemental floral resources and support pollinators, thereby enhancing the value of urban green spaces." Details appear in the current issue of Annals of the Entomological Society of America. For this study, supported by the National Science Foundation, the researchers enlisted owners of 17 lawns in suburban Springfield. Between May 2013 and September 2014, the homeowners did not apply chemical pesticides or herbicides to lawns. "We documented 63 plant species in the lawns, the majority of which were not intentionally planted," the authors report. Lerman and Milam visited each yard six times per year for two years, finding a total of 5,331 individual bees representing 111 species, of which 97 percent were native to North America. Of particular interest was the discovery of a large population of Lasioglossum illinoense, a widespread sweat bee species and common in its range, but known in Massachusetts only from a single specimen collected in the late 1920s. The population of L. illinoense in Springfield lawns documents the northeastern range limit for this species. Conserving native bees for their vital pollination services is of national interest, Lerman and Milam point out, and this new information on native bee distribution and abundance is important for making informed conservation and management decisions regarding pollinator conservation. Overall, one of their main findings, say Lerman and Milam, is that "when lawns are not intensively managed, lawn flowers can serve as wildlife habitat and contribute to networks of urban green spaces." Further, "developing outreach to homeowners and lawn care companies to encourage, rather than eliminate, lawn flowers such as dandelions and clover and thin grass cover or bare spots could be a key strategy for urban bee conservation programs targeting private yards."